« Episode 7: Interview with Aloysius Fox! 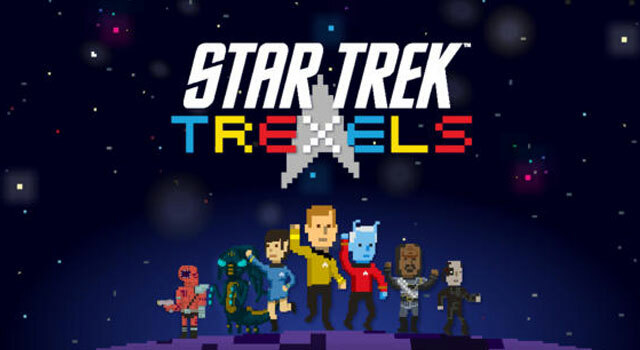 Game app Review: Star Trek: Trexels! The day Star Trek: Trexels was released, at first I was excited! Then I thought to myself, “What if it’s just like Tiny Death Star?” So, I went ahead and paid the $2.99 to give it a go, if for no other reason than to review it. I am happy to say that, though it does have some aspects of Tiny Death Star, Star Trek: Trexels is so much more fun! The game takes place in The Original Series era. A Constitution-class starship, the USS Valiant was on assignment exploring deep space. They came across a strange energy reading and were destroyed by a species called the Progenitors. The Progenitors ship looked a lot like the Xendi super weapon from Enterprise. You play the roll of a Starfleet Admiral and you are given command of a starship, though you are not the commanding officer, rather the ranking officer, but the ship isn’t fully built yet. So you have to build rooms as you explore the boarder of the Trexelian expanse. Some of the rooms you build give you resources like Command Points, Research Points, and Power Points. These resources are consumed to to carry out missions and to build more rooms and expand deck and bulkhead space. But, the resources aren’t automatically added to your resource pool… you have to manually tap each resource room to collect your stuffs. The only resource that is difficult to get is Dilithium, which you need for certain rooms and missions. You can earn it by completing Starfleet assignments, or you can use the in-game purchase to buy some with real money. I tried this a few times just to see how easy it is and how quickly you get your resource, because with Tiny Death Star, the in-game purchasing was rather laggy getting you your Imperial coin. I am pleased to say that the in-game purchasing is quick and easy! You also have the option of buying Wrath of Khan era and TNG era uniforms for your crew as well! Though the game takes place in the TOS era, familiar characters and races will make an appearance! For example, imagine the Borg boarding a Constitution class starship and you need to defend your ship against the attack! Yeah! I did! And I won! How you ask? By beating the mission! And how do the missions work, you ask? You enter a scenario. Let’s use the Borg for this. Dialog is spoken, setting up the stage. Then the battle or situation begins. You have two types of bars at the top of your screen; a progress bar and a damage bar. Your First Officer will release command cubes. You must tap on these cubes to collect them. At the bottom of the screen, you have an attack button and a “fix” button that will say different things depending on the situation. The attack button will, at times, say different things as well. The more command cubes you collect, the more times you can use the attack button to fill your progress bar. The “fix” button will take away your damage bar. But, here is the trick… the missions have a time limit. So, you need to figure which to focus more on: Progress or damage. But, you haven’t explained how the Borg get into the 23rd Century! A temporal rift in the Expanse has brought friend and foe from the past and future together. And you thought I was joking with the Doctor Who reference. One thing that took me by pleasant surprise was George Takei doing the narration! Also, the first main character you get is Sulu, which makes it even more amazing! The push notifications in the game let you know that you have assignments from Starfleet pending and when you have crew who are not currently on assignment. This isn’t necessarily a bad thing, but when you get two notifications from the game about the same thing, it gets annoying. Furthermore, if you turn off push notifications in settings as well as within the game, you will still receive the double notifications. I know they are planning quite a few expansions for this game, and I hope this is a bug they plan to fix. The only redeeming factor about the notifications, is the fact that the sound is the TOS communicator being opened sound. Another downside to the game is that it eats your battery rather quickly. Even if you just play it for a few minutes, it take a nice chunk off your battery. But, to the games credit, there is a lot going on within the game. Again, I hope they address this with future updates. Though I haven’t gotten very far in the game, in all, cute graphics, compelling storyline, building your own ship the way you want it laid out, and George Takei makes this iPhone game worth the $2.99! I am looking forward to seeing what they do to make the game better and to keep you coming back for more!